Main card page: "Salamangreat Sanctuary"
For earlier anime appearances of this card, see "Salamangreat Sanctuary" (anime). 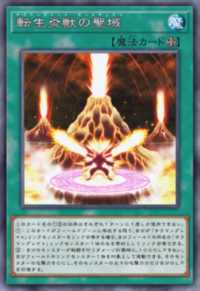 If you Link Summon a "Salamangreat" Link Monster, you can use 1 "Salamangreat" Link Monster you control with its same name as the entire material. During damage calculation, if your monster battles: You can pay 1000 LP, then target 1 Link Monster you control; make its ATK 0, and if you do, gain LP equal to its original ATK. You can only use each effect of "Salamangreat Sanctuary" once per turn. This page was last edited on 28 March 2019, at 01:41.